Lately, I’ve been frustrated with the bloated nature of CD burning software like Nero and Roxio. Both have added so many features that making a simple data CD/DVD or burning an ISO image can be an huge ordeal. Not to mention the programs running in the background that wast processor and memory resources. About a month ago, I ran across the program, CDBurnerXP. 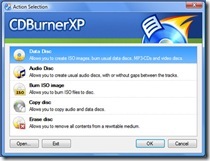 It’s everything that you want a CD burning program to be; quick, simple and free. When you open the program, all you get are options to make a data or audio disc, burn an ISO image and copy/erase a disc. I remember the good old days when Nero was that simple to use and not taxing my system. I have been using this program with great success on Vista, XP and Server 2003. I only hope that it doesn’t get needlessly bloated as it’s predecessors. 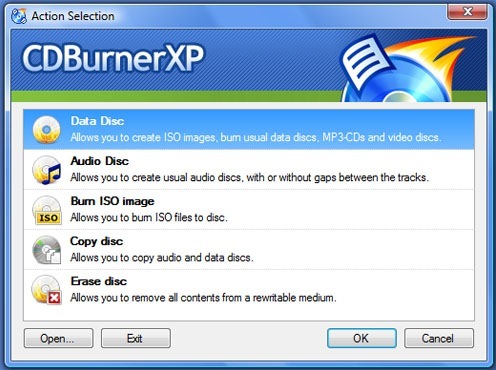 If you haven’t all ready tried CDBurnerXP, download and install it! You will not be sorry.